I was very careful to have all the wires and connections right, as I described in last post. Nevertheless I commited a stupid mistake, quite embarassing one. 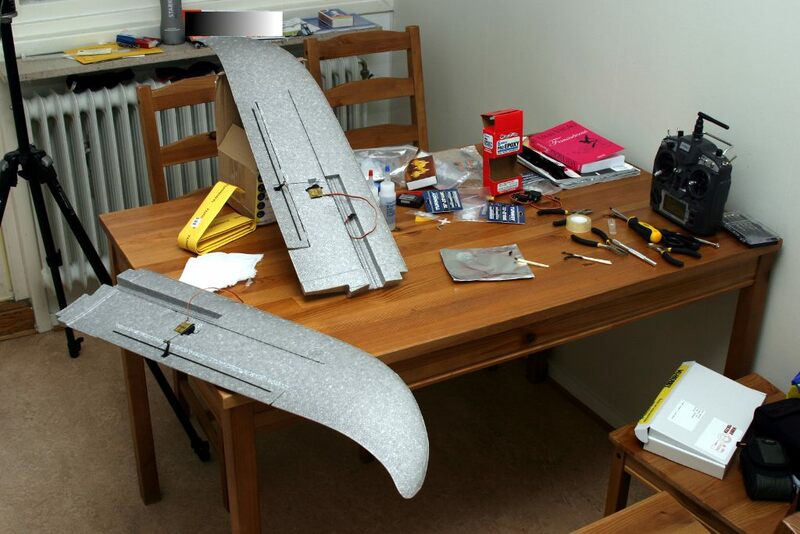 Since the two halves of the fuselage are glued together it is good idea to go through everything before you actually glue togerther the fuselage. I had servo wire extension leads routed forward so that I can connect extra components later. I wanted to connect the ESC directly into the receiver, however I connected it to the wrong channel. There is a “battery channel” above all the other channels. 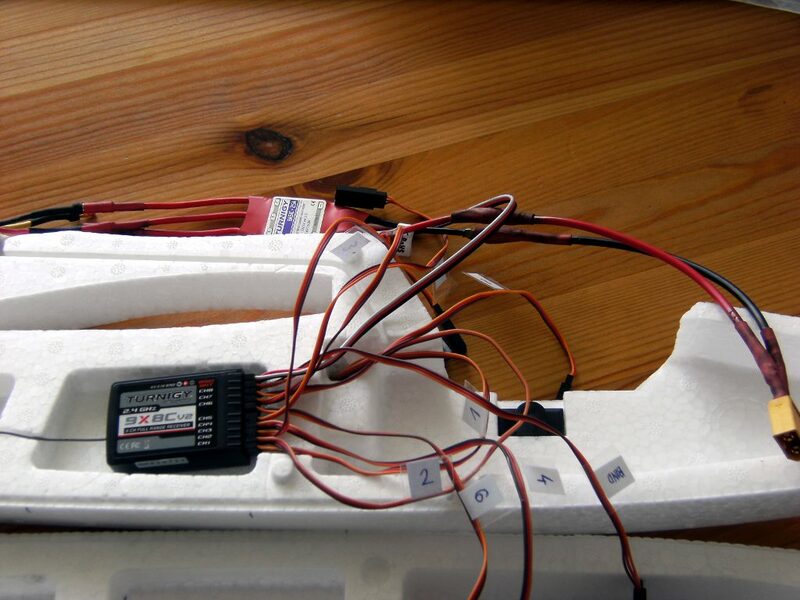 You may connect the ESC here for testing the servos, they will work fine. But you cannot operate the motor from here. I noticed this when I connected everything and wanted to test the motor. It never beeped as it should be (telling the number of cells of the battery). Then I knew that I made wrong. 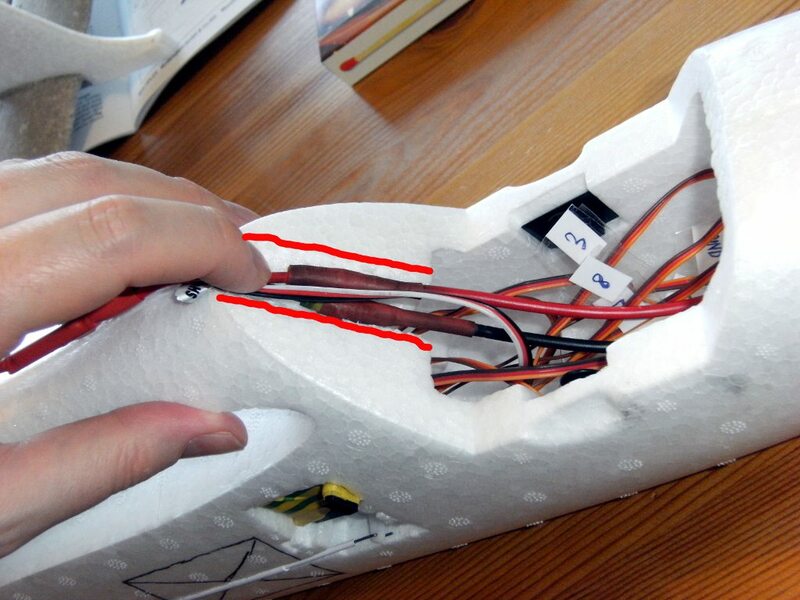 I was forced to cut open the fuselage, fortunately I marked where that cavity is located in the fuselage. So I cut a small brick out and could retreive the connector. Then I could replug it to channel 3 as it should be. When everything was connected I did some testing again. Last time I haven’t actually checked if the ailerons are set right. They weren’t I had opposite travel on the aileron channels. 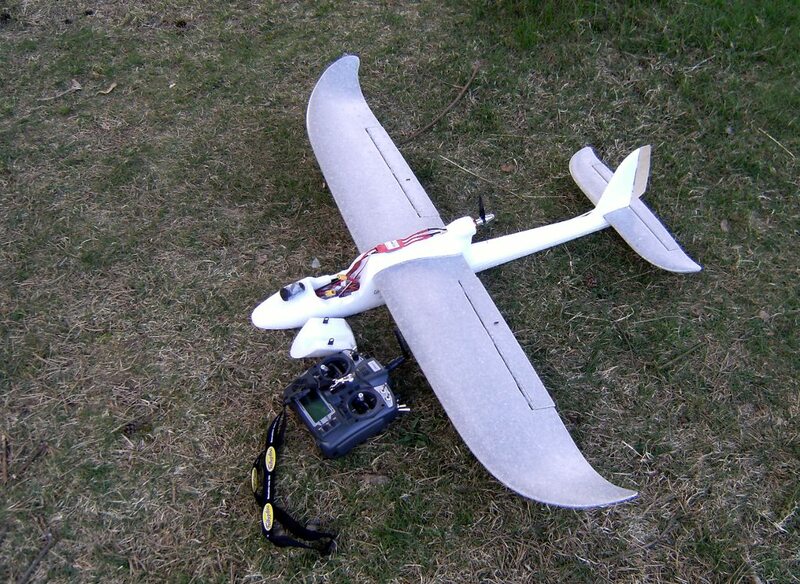 If I launch the model so I perform the shortest maiden flight of them all, I would have crashed short after. Good to check everything. So please find here my test installation and then my test recording. Made with a hat cam. I will need to set the canopy hatch and then the model is ready to maiden, I think. Maybe during next week this will happen. Very exciting. Please find the follow-up of my build here. Last time I started with the actual build, now I shall tell you how I continued. 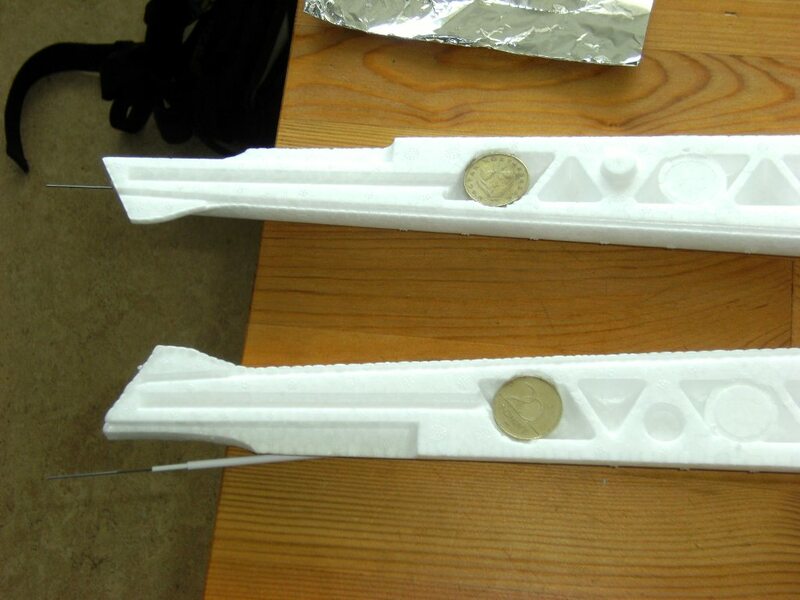 I intend to have an installation that does not require any future opening of the 2 fuselage halves. So I thought of using servo extension wires and lead all 8 channels forward. I got into a dilemma: should I use one lead for the ESC even or not? I checked how the ESC lead would connect to the extension wire and was not 100% sure of the connection. So I went for directly plugging the ESC into receiver. That connection is solid. It would be a pity to lose the model do to a sloppy electrical connection. I added some ballast weight in the rear. My experienced RC colleague raised this point to me, very important indeed! 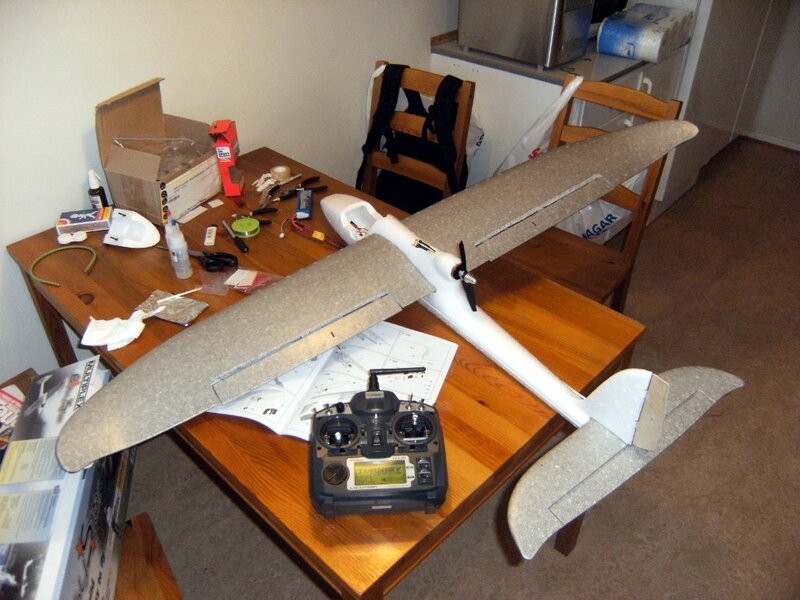 As I plan to have FPV gear in the front the plane will get nose heavy. 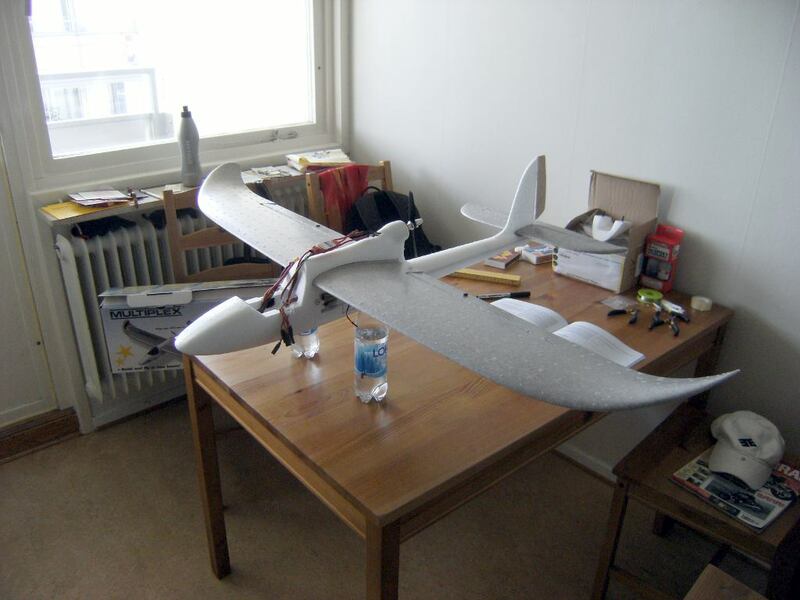 So it is better to have weight in the tail and compensate with extra weight in the nose until I replace the front ballast with FPV gear. I am not sure if I did enough in the tail but more than nothing. The receiver is going to sit on velcro tape. 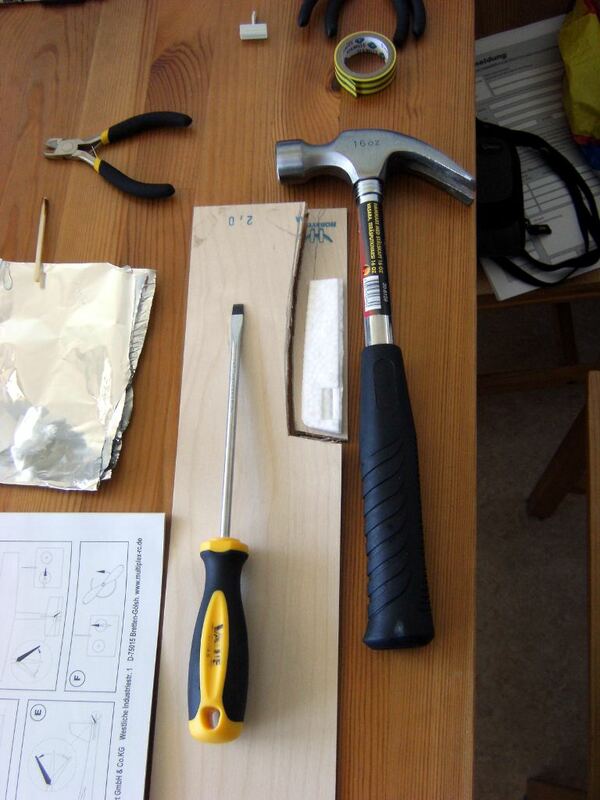 This will secure it to left side fuselage half. 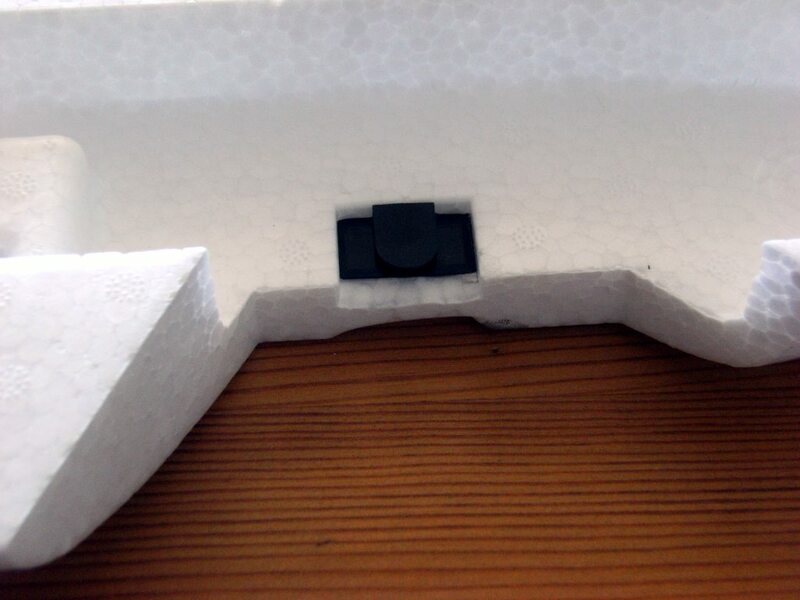 I tested the extra strong adhesive velcro on canopy to see if it will “eat” the foam (if it will get into reaction with the foam, to formulate this nicer). It did damage it, so I used my non-adhesive velcro and epoxy. Using the wing joiner rod I try to test mount the tail. It should be parallel to the main wings. 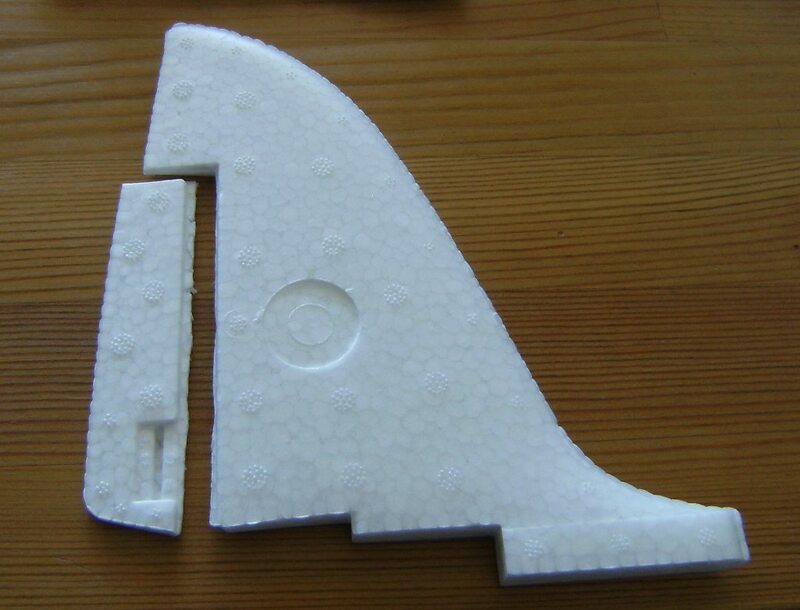 There is a slight angle, I will try to correct this during the epoxy hardening process. 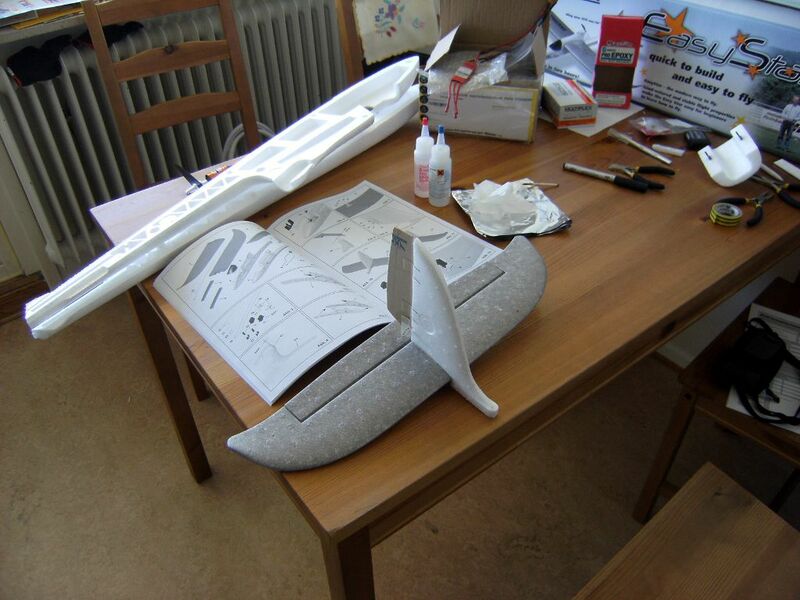 I glued on the tail, connected pushrods to stabilizers. Mounting test, everything is put together. Servos connected, motor is NOT connected. 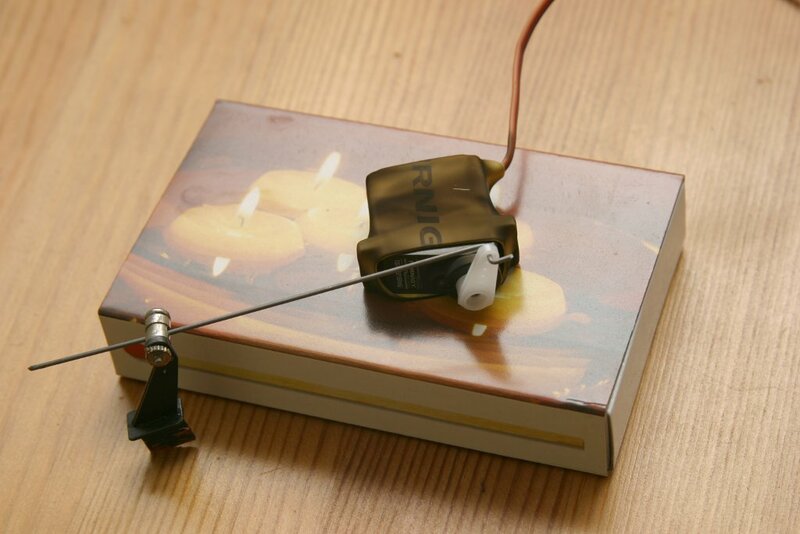 This is quite important, a live motor can be dangerous, only plug in your motor when you are sure of it. Next picture shows my amazingly low budget balancing stand. I forgot how much those mineral water bottles cost, but since my wife buys them anyhow I could consider their purchasing cost zero in my modelling perspective. I had to fill them up though, so some water cost is there. Water is needed to stability, the bottles sit more solid this way. 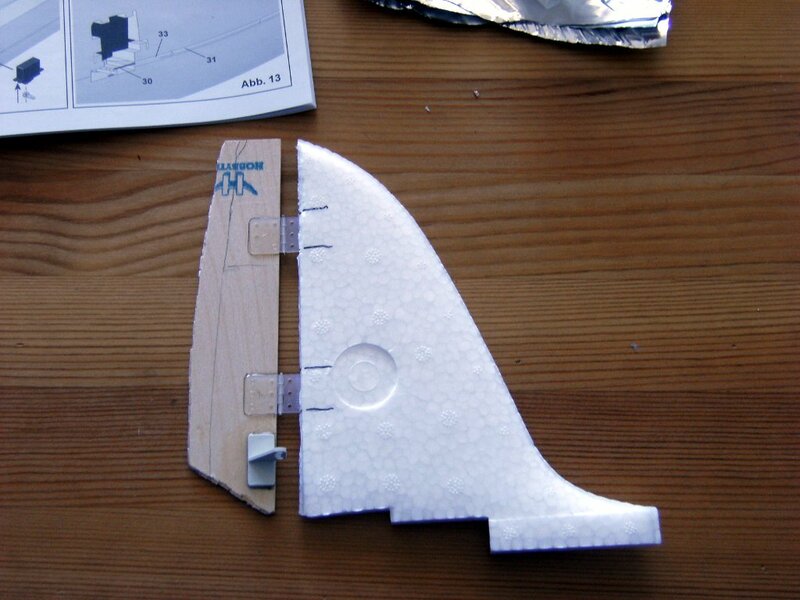 I put the model onto the bottle caps and aligned them so that the center point will get 5 mm in front of rear seam of wing joiner cover. The manual shows this very clearly, you can check it there. The manual of this model is truly excellent, the germans did great job with the design. 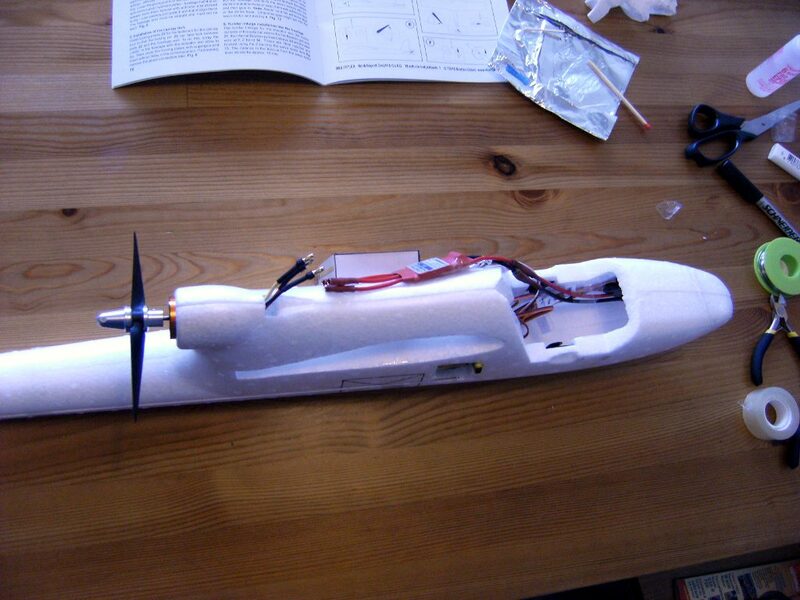 I had the battery in the nose (all the way to the front) and checked if it is easy to nudge the model out of balance. It was sitting quite okay. So I could clear the preliminary balancing. The video recording of all this can be viewed here, please. 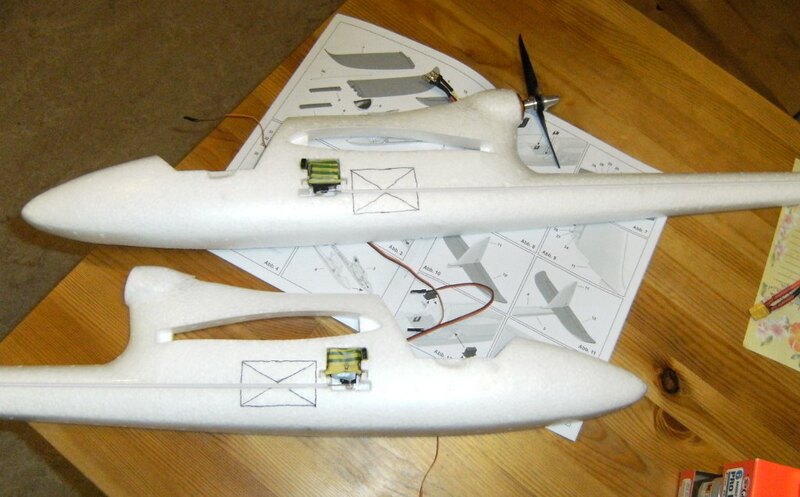 I will need to put some coins in the nose as well, they will be standing in until my FPV gear will get sorted out. This concludes my balancing. Then I glued in cockpit clip bracket. 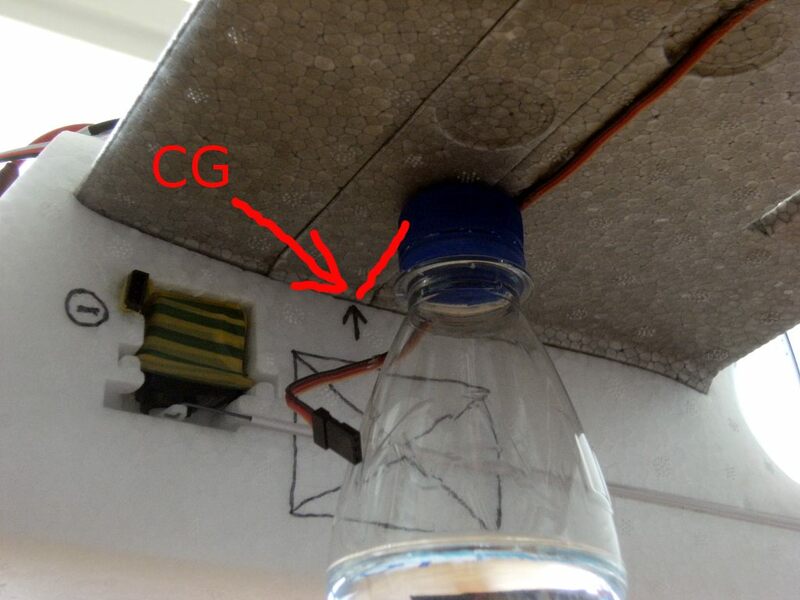 Notice that the rudder is not glued in place, the hinges are test mounted on picture. Glued the tail, was very careful to have 90 degrees angle between stabilizers. I want to have a plane that is capable of flying straight. 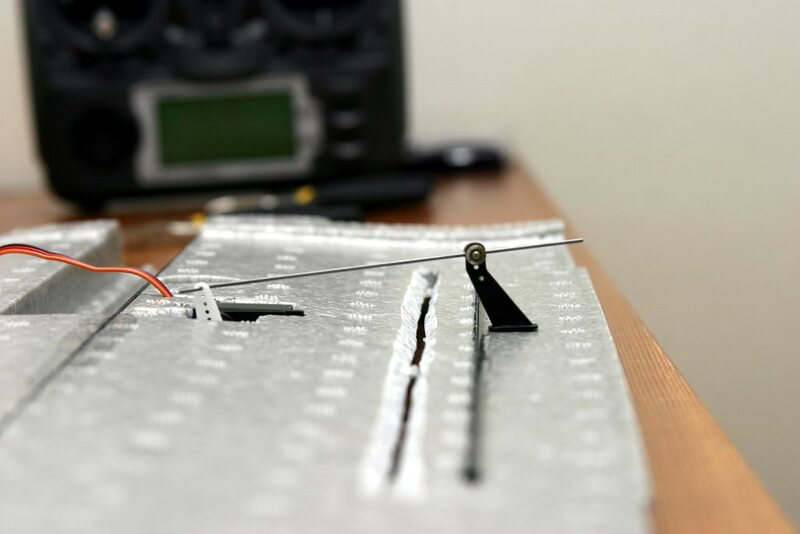 Test mounting of radio receiver unit. 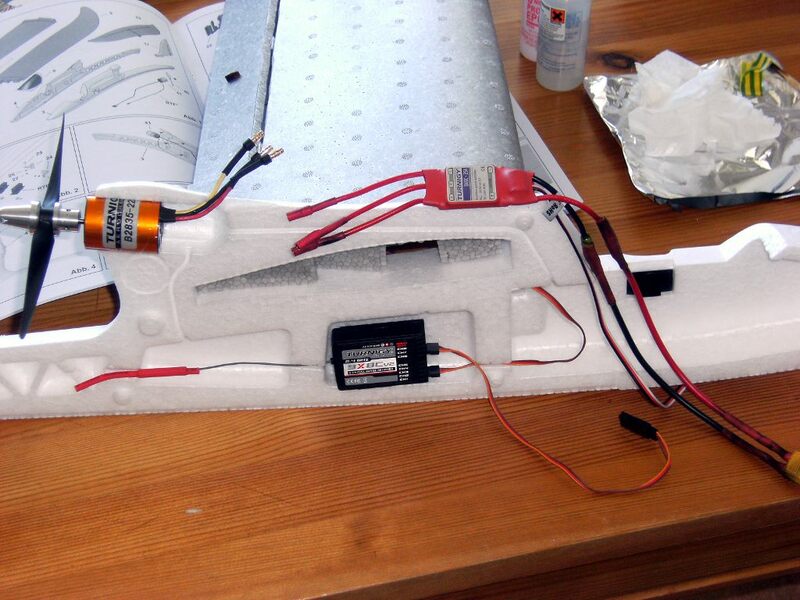 Since the fuselage halves will be glued together I need a bullet-proof solution for the receiver. 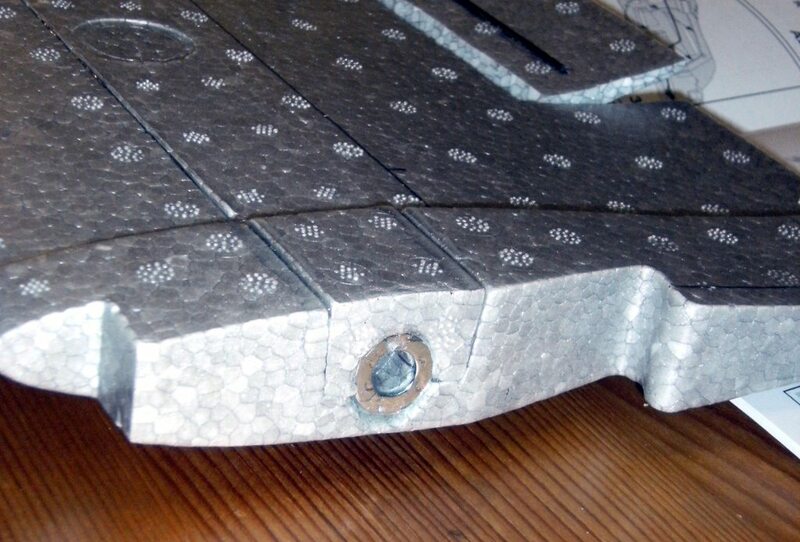 I thought of carving out some foam in front of it and having servo extension wires going into the front. So that when I will need the rest of those 8 channels I can just plug them in. 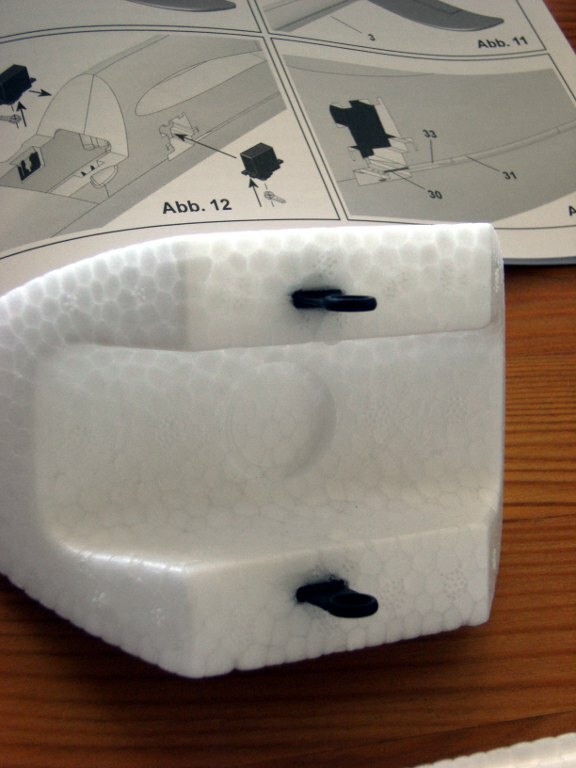 And then I don’t need to tear down the foam fuselage. 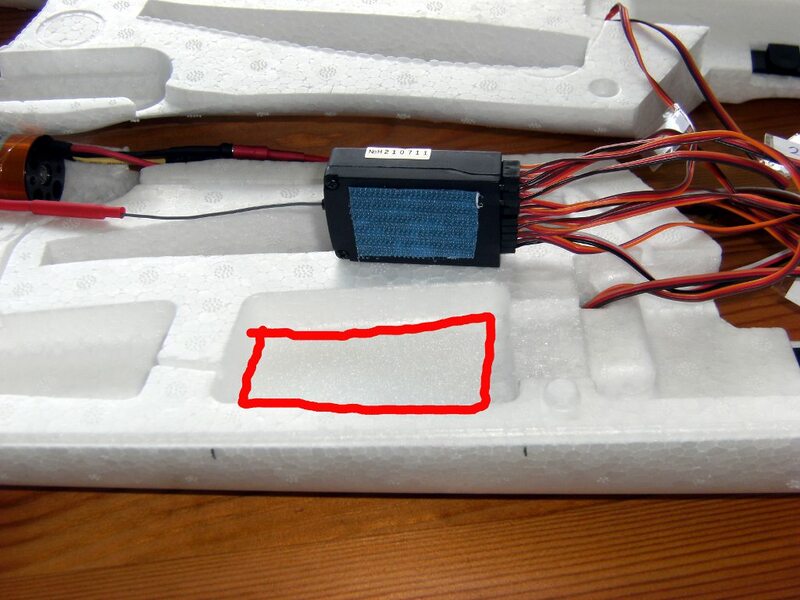 I thought to have the ESC wires in front, slightly carved into the foam. So that when I shall have my FPV mount on place the cables won’t interfere with it. A future-proof build I intend to have. I used a d 8,5 mm inner diameter plain washer to support wing retainer rod. 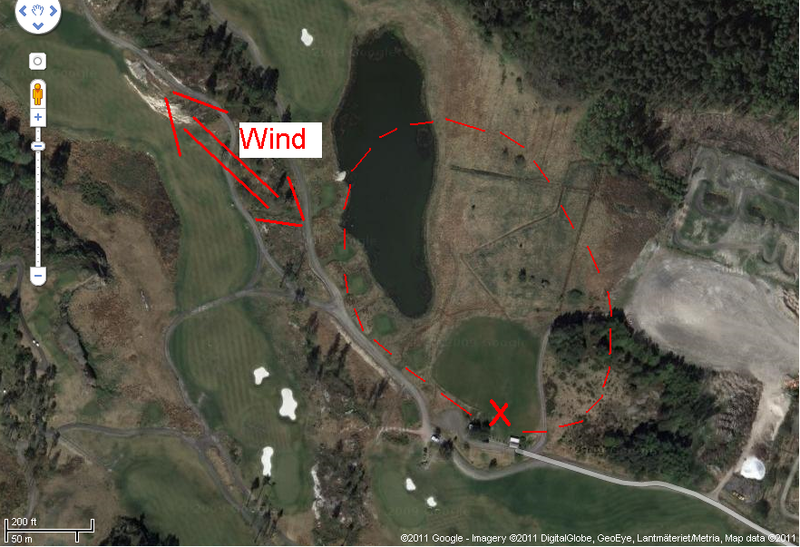 So that the entry of the hole will not get sloppy with time. Epoxy glued it there. 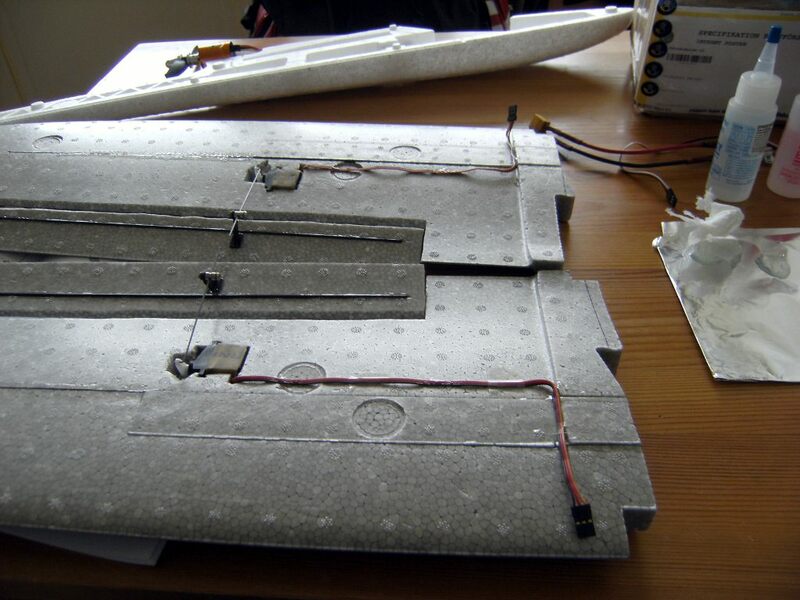 I secured servo cables onto the wings with small blobs of epoxy. 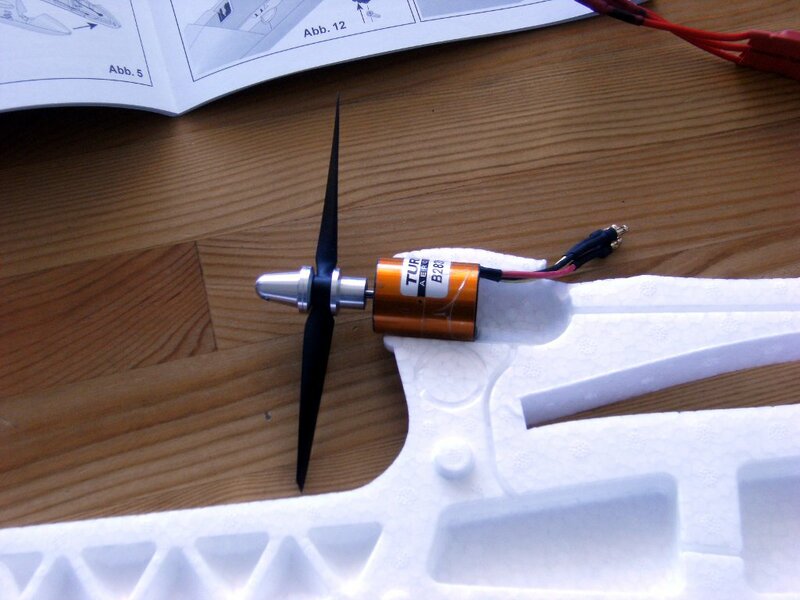 In case of damaged servo it can be removed with some dexterity. In normal use it will not allow the wires to vibrate. 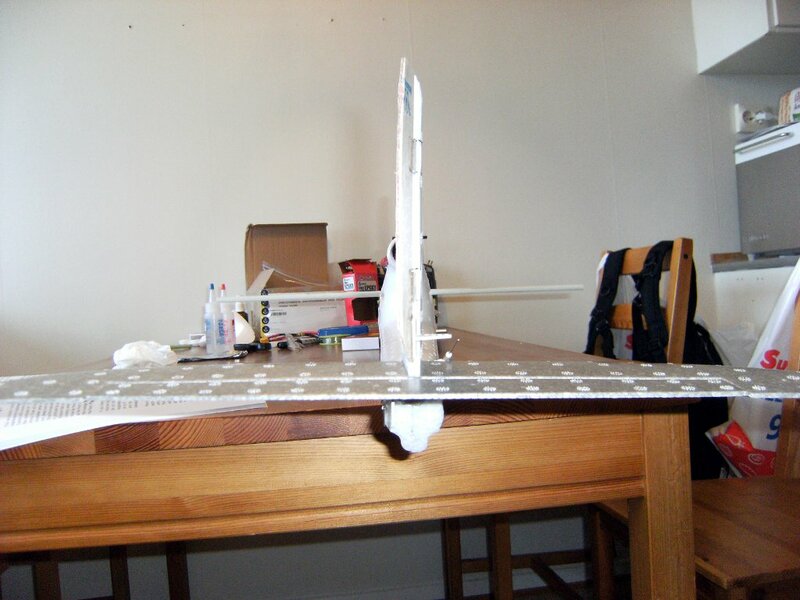 I left some length available so that I can connect to the connectors on the fuselage. 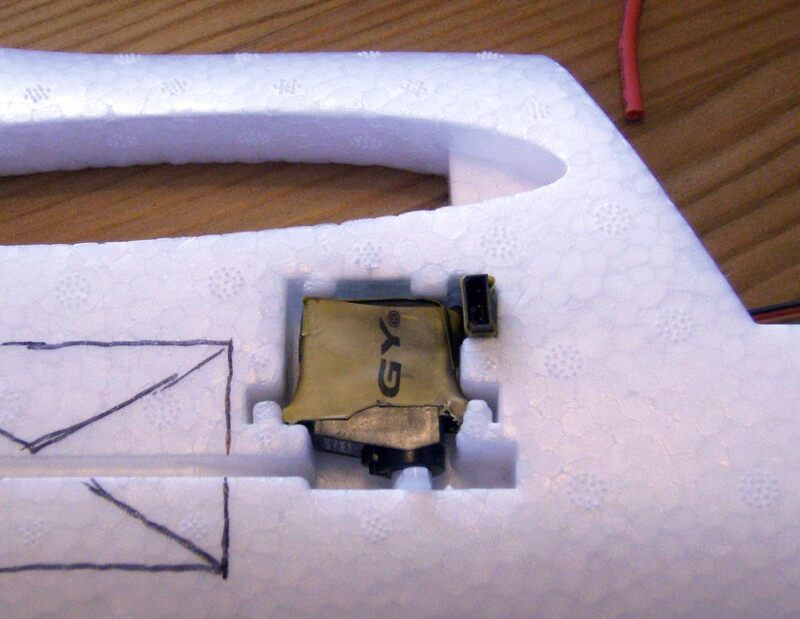 Rudder and elevator servos are glued in place. 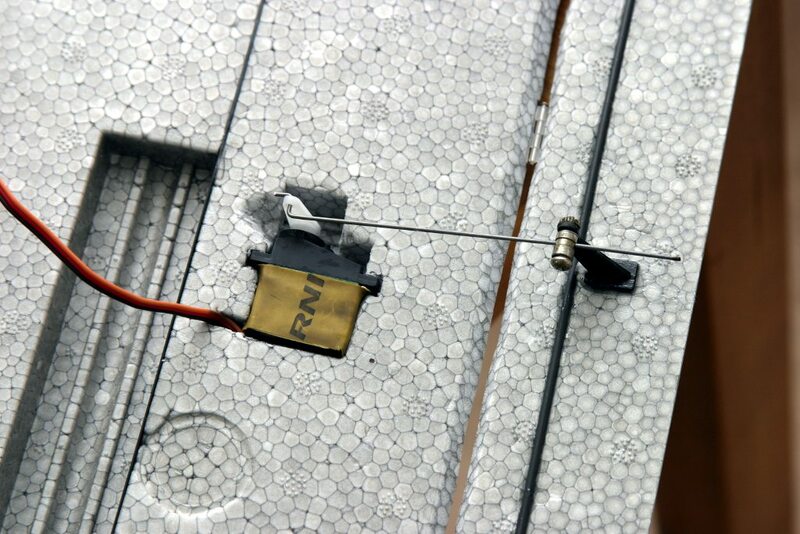 The cable channel could be used to glue there a 20 cm servo lead extension wire coming from the receiver. This will allow me to connect aileron servo leads coming from the wings with ease. Connector is solid fixed in fuselage, easy to connect to. 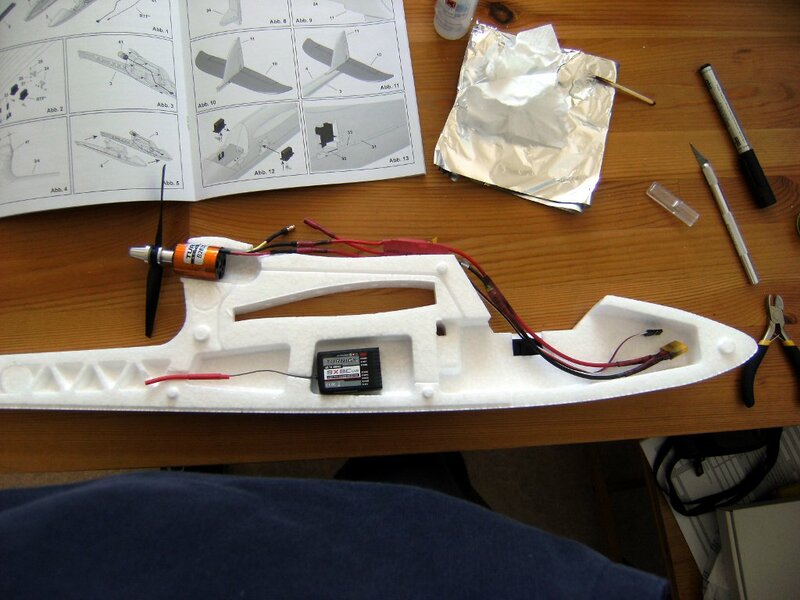 I will mark polarity on the fuselage, ground wire is on bottom. 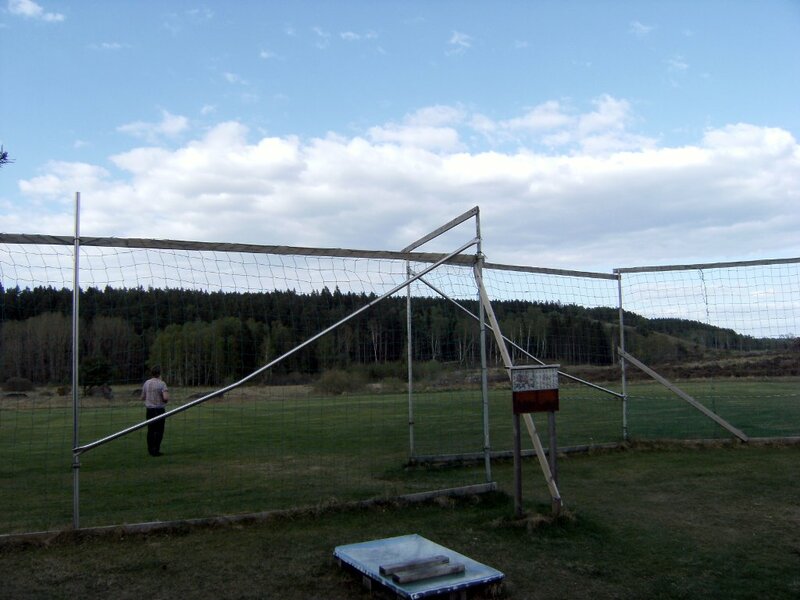 As ground is usually. Two half parts mostly done. 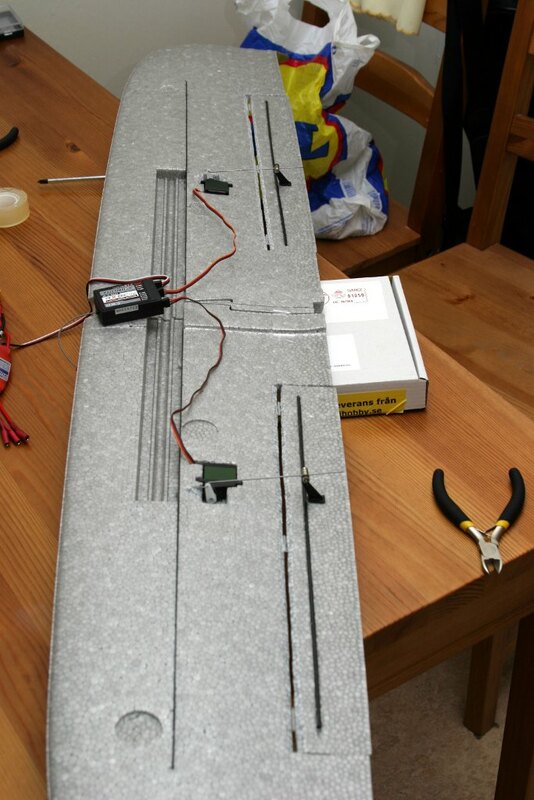 I even glued in the pushrod wires (bowden) along the fuselage. Next I will need to locate the electronics to their respective location. 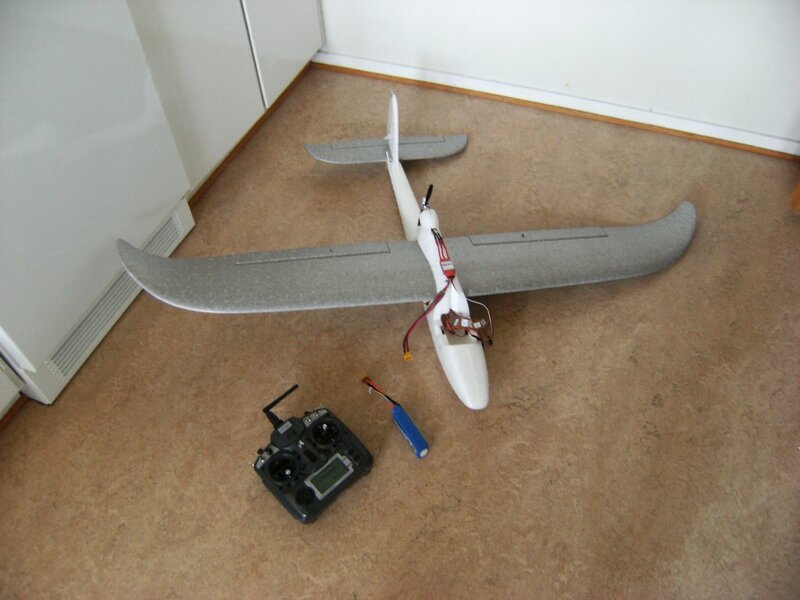 The ESC and the receiver need a good fixation and wiring routing. I have a concept already, will develop it in detail. This build is very exciting. I took my time with the wings and those small details that deviate from the standard build. I know that it is very difficult to have a perfect build from the start but I would like to get as few mistakes in my build as possible. We shall see how I manage.